The present study was conducted to isolate and characterise Pb-resistant lactic acid bacteria (LAB), and thus determine their potential for use as probiotics against Pb toxicity. A total of 107 Pb-resistant LAB strains were isolated from the gut content of Cyprinus carpio, of which 41 were established to be gram-positive and catalase-negative. Investigation of the Pb-binding ability of these isolated LAB identified seven strains (P2, P6, P7, P9, P16, P19 and P22) with comparatively high Pb-binding activities. These were selected for further screening to establish their Pb tolerance, anti-oxidative capacity and in vitro probiotic characteristics. Strain P16 exhibited both the highest Pb-binding and a relatively good antioxidant capacity. Furthermore, P16 displayed a high survival rate during 4 h of exposure to both low-pH (2.5–3.5) conditions and 10.0% fish bile, and a strong capacity to adhere to fish intestinal mucus (62.4%). Furthermore, P16 showed strong antibacterial activities against all tested fish pathogens. Strains P6, P9, P16, P19 and P22 were susceptible to a range of tested antibiotics, but not to vancomycin. 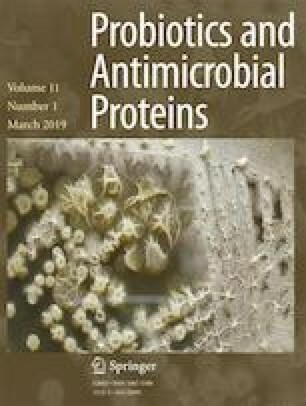 Thus, of the isolated lactobacilli, strain P16 exhibited the best Pb-binding ability, a high level of antioxidant activity and satisfactory in vitro probiotic properties. Biochemical and 16S-rRNA gene analyses identified P16 as Lactobacillus reuteri. Thus, the results of the conducted in vitro tests suggest that the fish-associated P16 Lact. reuteri strain is a promising candidate probiotic, which should undergo further investigation to assess its suitability for use in protecting against lead-exposure-induced toxicities in aquaculture. This research was supported by the ‘Korea Research Fellowship Program’ of the National Research Foundation of Korea (NRF), Ministry of Science and ICT (2016H1D3A1909005) and by the NRF grants funded by the Korean government (MSIP) (NRF-2014R1A2A1A11050093, NRF-2017R1C1B2004616).